Now you can create, build and customize your own world of Minecraft with these highly detailed and fully articulated 3" scale action figures with accessories. 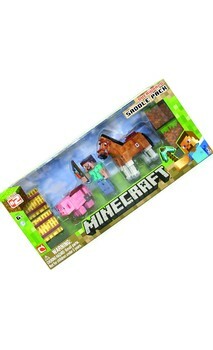 This Saddle Pack set includes a Steve figure with whip, Horse with saddle, Pig with saddle, x2 Hay Bales, and x2 Grass Blocks. Steve, Horse and Pig figures are articulated. Officially licensed, collect them all! Now you can create, build and customize your own world of Minecraft with these highly detailed and fully articulated 3" scale action figures with accessories. This Saddle Pack set includes a Steve figure with whip, Horse with saddle, Pig with saddle, x2 Hay Bales, and x2 Grass Blocks. Steve, Horse and Pig figures are articulated.